Simplicity is underrated. Perfection is overrated. But what do you do when you find a wine that is quite simply perfect? Well, you enjoy it first. Then, if you're me, you write about it here and hope that you can still get your hands on some later. Some readers will find it surprising that the wine that I'm touting is a Sauvignon Blanc. One person I know recently described Sauvignon Blanc as "boring," and while I couldn't disagree more I think I understand why some she might feel this way. There are a lot of generically "citrusy" Sauvignon Blancs out there that, though refreshing, aren't necessarily going to make you run out and buy more. I think this Sauvignon Blanc is different, though. And even though you might pay a smidge over $20 as I did, I think you will still consider it excellent QPR. 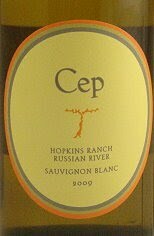 The 2009 Cep Vineyards Sauvignon Blanc Hopkins Ranch ($20.99 in my local independent grocery store; available in the market for $15-$20) is a wonderful example of Sauvignon Blanc. Instead of a generically "citrusy" mouthful, I detected pure notes of Meyer Lemon in the aromas and flavors. There was a clean note of mint, as well, and some stoniness that added depth and breadth to the wine. It was almost piercing in its intensity, but never overwhelming or assertive, with lots of focus to the flavors and a long, juicy aftertaste. Think of pairing this wine with Asian food that uses citrus elements like orange peel or lemon, a roast chicken, an early spring salad topped with rounds of goat cheese, or seafood. This stylish, well-made, and satisfying wine was brought to you by the same people who own and operate Peay Vineyards, and are winemakers renowned and respected for their ability to select great fruit and craft great wines from that fruit. Cep is their second label--which means that fruit that doesn't quite make the cut of their high-end wines is bottled under a different name--and was for a time a well-kept secret. Now the secret it out, and it gives more people a chance to taste their winemaking efforts. Cep also bottles a superb rosé and Pinot Noir, so keep your eyes out for these, too. I'm the only wine drinker in my house. And there are times, like now, when things are so crazy that planning menus and opening bottles of wine that will in all likelihood go off before I can finish them up doesn't make sense. Enter the new generation of boxed wines. I'm particularly partial to the Octavin, which has a fantastic spigot contraption that doesn't leak or drip. There are other options out there, too, and all of them keep air from getting to the wine thereby keeping the wine fresh-tasting for weeks, rather than days. The only downside of the Octavin is that with white wines they take up a certain amount of prime refrigerator real estate. With reds, you just set them in a cool place on the counter and enjoy a glass whenever the mood strikes. The very good QPR NV Bodegas Osborne Seven is a blend of Cabernet Sauvignon, Merlot, Syrah, Petit Verdot, Tempranillo, Grenache, and Graciano. With all those grapes in it, it's hard to pin a varietal character on the wine. Instead, this is a "red" wine--which is not a bad thing on a Tuesday night when you're making Mark Bittman's chicken with roasted potatoes and Romesco sauce. I could smell the Grenache in the floral and fruity aromas. The Syrah and Petit Verdot are evident in the flavors which span the plum and blackberry spectrum. There are some darker notes, too: dark chocolate and ground coffee. This wine will go with pasta, soup, stew, pizza, burgers, steaks--you name it.